At 17,207 acres, Dallas-Fort Worth International Airport is larger than the island of Manhattan. The airport – which sees more than 69 million passengers every year – is one of the most frequently visited superhub airports in the world. With all of that land and five terminals, it's no surprise that a DFW airport guide is necessary for getting around. Dallas-Fort Worth International Airport, known as “DFW,” opened in 1974 with eight signatory carriers and four additional carriers. Early on, DFW nonstop international flights consisted of two daily flights to Mexico, a flight to Jamaica, and Air Canada service to Toronto. 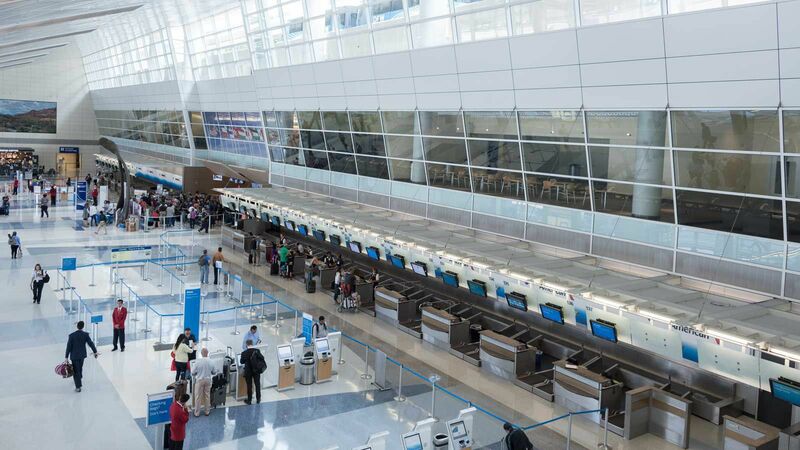 Today, passengers at DFW can choose among 182 domestic and 62 international nonstop destinations worldwide. DFW airport is situated between Dallas and Fort Worth, and is so large it has its own zip code, city designation (DFW Airport, TX), police, fire, and emergency medical services. Travelers have had direct access on public transit to Dallas with the DART (Dallas Area Rapid Transit) rail since 2014, and as of January 2019, travelers also have direct access on public transit to Fort Worth via the TEXRail service. The DART station is located in Terminal A, and the TEXRail station is located in Terminal B. These stations have access to all terminals provided by Terminal Link (on the non-secure side) and Skylink (on the secure side). Inside the airport, bouncing from terminal to terminal after security is easy with Skylink, which can move between terminals in less than 5 minutes. With so much terrain to cover and almost 2,000 daily flights to choose from, it can be stressful to navigate the larger-than-life airport. Whether you’re worried about finding a healthy airport meal or in a mad dash to make your flight, this guide to DFW airport will help you find your perfect plan before takeoff. DFW has free Wi-Fi for visitors in all terminals, parking garages and gate-accessible areas. There are four parking options available, including valet, terminal, express, and remote parking. Valet parking ($31 a day, plus tax) is available at all terminals with no reservation required. Terminal parking ($24 for 24 hours) is available at each terminal with more than 20,000 total parking spaces. Express parking ($12 daily rate) is offered at the north and south ends of the airport where travelers are shuttled into the airport. Remote parking ($10 a day) is also located at the north and south entrances of the airport with travelers being bused into terminals. DFW’s Terminal Link provides free shuttle service between terminals. In 2018, the airport introduced Prepaid Parking Online, which can save travelers up to 50% on parking. This option is available for terminal, express, and remote parking, and customers simply choose and pay for their parking online ahead of time. American Airlines customers can park and check in at any terminal. Renting a car is easy at DFW considering the airport has a 24-hour car rental center with 12 different companies offering the service. 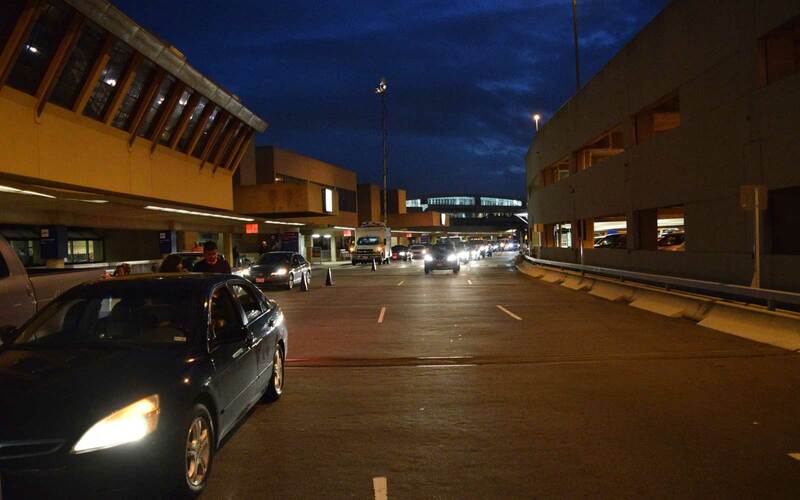 For arriving and departing passengers, shuttles cross between the airport and rental center every 10-15 minutes. Though there are many hotels in the area surrounding the airport, there are only a few DFW airport hotels on the actual grounds itself. The Grand Hyatt DFW is located inside Terminal D and is accessible by Skylink and Terminal Link. Other hotels include the Hyatt Regency (near Terminal C), and Hyatt Place, located inside Southgate Plaza near the rental car facility. Dallas-Fort Worth International Airport’s Terminal A is exclusively operated by American Airlines and has 26 gates. This terminal is one of four in the airport that has TSA PreCheck, which is located at gate A21. The airport lounge available here is the American Airlines Admirals Club, located at A24. Terminal A has a wide range of eateries including coffee shops and bars. For fast food, there are two McDonald’s in this terminal and a Popeye’s Louisiana Kitchen for a fried chicken fix. Twisted Root Burger Co. offers a taste of Dallas’ Deep Ellum district, and Salt Lick BBQ transports travelers to the Texas Hill Country for a taste of true-Texas ‘que. Coffee is available at numerous spots including Starbucks, Einstein Bros. Bagels, and Dunkin’ Donuts, and bars include Bleu Mediterranean Bar with an expert mixologist and Vino Volo, an award-winning wine bar. Terminal A is a great terminal for high-end shopping spots and quick airport necessities. Grab a travel pillow or headphones from Brookstone, and don’t forget a jersey representing America’s Team from the Dallas Cowboys Pro Shop — one of three in the airport. Johnston & Murphy has fashionable men’s clothing, and there are plenty of options to grab skincare products before your flight with shops like Kiehl’s, MAC Cosmetics, Benefit Cosmetics, and L’Occitane. For cheesy-yet-necessary Western souvenirs, the Stockyards Marketplace is a must. And for plane reads, CNBC News, Hudson News, and Southwest News have you covered. Terminal A also has a currency exchange. For a last-minute haircut or styling, XpresSpa is a full-service hair salon. Minute Suites offers private suites with daybeds, workstations, printers, and fax and scan machines for rest or work time, and The Bubble presented by Coca-Cola is a nice spot to relax with charging stations, TVs, comfy seating, and vintage Coca-Cola décor. Charging stations are located at gates A10 and A24. Terminal B has 47 gates and is also exclusively operated by American Airlines. Security checkpoints are located at gates B9 and B30. The airport lounge located here is the American Airlines Admirals Club, located at B3. This terminal also offers a USO lounge for active members of the U.S. military and their families, complete with Wi-Fi, video games, TV, bathrooms, food, a sleeping area, computers, charging stations, board games, and more. 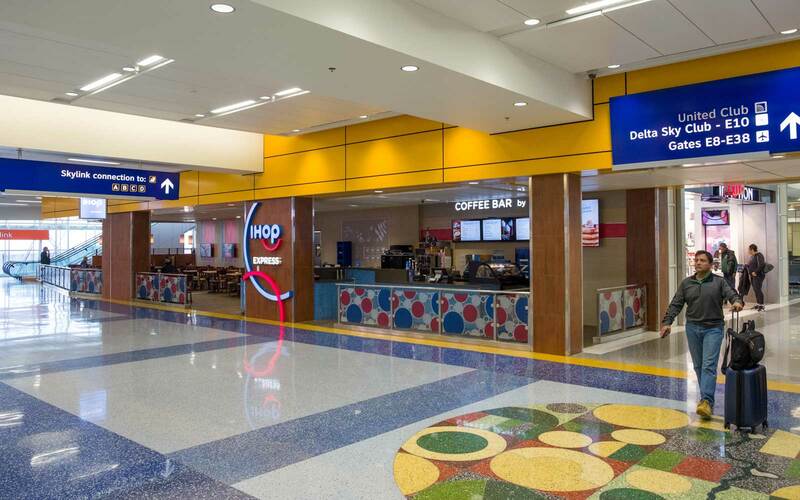 Terminal B has more casual and fast food options like Wing Stop, TGI Fridays, Panda Express, and Subway. For coffee, there is Starbucks, McDonald’s, and Dunkin’ Donuts, and the hard stuff can be found at Rodeo Bar. For last minute Tex-Mex, Cantina Laredo offers nachos, tacos, and traditional Tex-Mex fare, while Cousin’s BBQ has two outposts in the terminal for barbecue. Icebox Café has fast-casual grabs like sandwiches and paninis, and UFood Grill gives a nutritious (never fried) take to burgers, wraps, and fries. Have a sweet tooth? Natalie’s Sweet Gourmet is a self-serve candy store with more than 300 varieties of treats. Terminal B is full of places to purchase the latest magazines, books, and newspapers, including Hudson News, Sierra News, and Texas Monthly News. Eddie Bauer has clothing and accessories for men and women, and Brighton Collectibles has beautiful leather and silver accessories. Texas souvenirs are found at Texas Marketplace and Texas Territories, and upscale luggage and accessories are at the Travel + Leisure store. For electronics and entertainment, head for InMotion Entertainment or the Best Buy Express kiosk. Gameway is a new addition to the airport (B42) where travelers can play Xbox One games on 4K TVs with noise-cancelling headphones, leather chairs, and charging stations. Be Relax Spa can assist with manicures, pedicures, and massages, and the DFW Airport Travel Lounge has complimentary lounge and workstation seating and power outlets at each seat. Charging outlets in this terminal are in the DFW Airport Travel Lounge at gate B28. Terminal C has 28 gates and is also exclusively operated by American Airlines. Security checkpoints are at C10, C21, and C30, and TSA PreCheck is at C21. The airport lounge in this terminal is the American Airlines Admirals Club, located at C20. The airport’s latest addition, Shake Shack, is located in this terminal. It’s the first Shake Shack in a Texas airport, and the first Shake Shack in the DFW region to serve breakfast. Craft beer lovers can unwind at Beer Union, and coffee fans can appreciate the Caribou Coffee & Einstein Bros. Bagels collaboration. Fast options include Chick-fil-A, Pizza Hut Express, and Boar’s Head Deli. Pappadeaux Seafood Kitchen and Pappasito’s Cantina are delicious Texas favorites, and Chili’s, Maggiano’s Little Italy, and Freshens Smoothies and Yogurt are also popular selections. Shopping in this terminal is similar to Terminal B with numerous magazine and book outposts such as Sierra News, Wall Street News, and Daily News Express. There is also a MAC Cosmetics in this terminal along with Benefit Cosmetics. Fort Worth Magazine offers Texas souvenirs and gifts, and the Emmitt Smith Sports store celebrates the NFL’s all-time leading rusher with apparel, footballs, and souvenirs. Spa Here offers hair services for men and women, plus massages and spa treatments. Charging stations are located at gates C20 and C35. Known as the international terminal, Terminal D has perhaps the best variety of dining and shopping available at the airport. 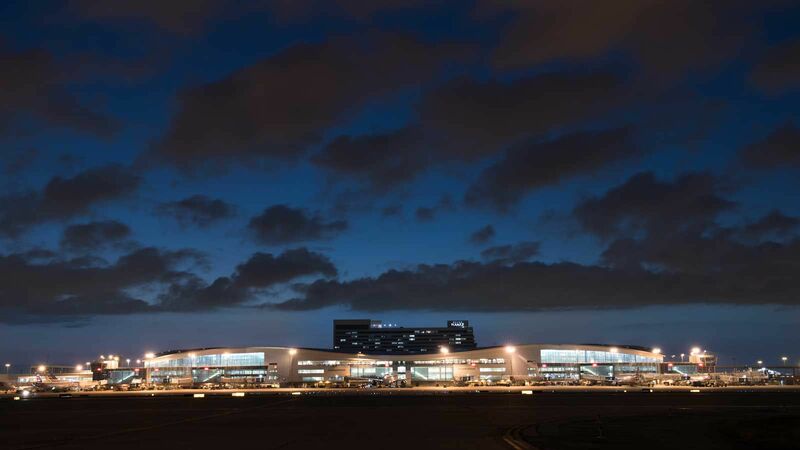 The airport’s new Duty Free location (D20) opened in this terminal at the end of 2018 and is a two-level space with world-class shopping, VIP concierge services, and 17,000 square-feet of space. The terminal has 28 gates and services AeroMexico, American Airlines, Avianca, British Airways, Emirates, Interjet, Japan Airlines, Korean Air, Lufthansa, QANTAS, Qatar Airways, Sun Country Airlines, and Volaris. Security checkpoints are at D18, D22, and D30 with TSA PreCheck available at D22 and D30. Airline lounges in this terminal are British Airways Lounge, Korean Air Lounge, Lufthansa Lounge, QANTAS Business Lounge, The Centurion Lounge, and The Club DFW. A large array of dining options are available in this terminal, from fast food to elegant sit-down establishments. Quick options include Applebee’s, Au Bon Pain Deli, Artisan Market, and Auntie Anne’s Pretzels. For coffee, try Lavazza Coffee or Moka. Elevated dining includes French cuisine at Whitetail Bistro by Kent Rathbun, The Italian Kitchen by Wolfgang Puck, Reata Grill, and Stampede 66 Express by Stephan Pyles. Terminal D has cuisine from multiple cultures, including Irish fare at Tigin Irish Pub & Restaurant, sushi at Shinsei, and Southeast Asian specialties at Banh Shop. For a cocktail or a beer, there’s the Flying Saucer, CRU Food & Wine Bar, or Grand Met Lounge. Terminal D features plenty of luxury shopping such as Montblanc, Longchamp, Kate Spade, Jo Malone London, Coach, and Michael Kors. Departing international travelers can buy cigars and whiskey selections at Whiskey Flights, and Texas gifts are found at The Range. For plane reads, there’s Univision, The Wall Street Journal store, World News & Gifts, and more. For all things tech, check out iStore for the latest mobile devices, plus Best Buy Express, and InMotion Entertainment. An urgent care facility and pharmacy are also available in Terminal D, as well as a currency exchange. Aside from the numerous lounges that offer day passes in this terminal, there are other things to keep you busy while waiting on your long-haul flight. To ease pre-flight stress, a yoga studio is available at gate D40 and mats are provided. XpresSpa helps travelers unwind with massages, hair salon services, pedicures, and manicures. If you’re coming off a long flight and need a shower, Minute Suites in Terminal D offer showers along with workstations and daybeds for napping. A children’s play area is located by the McDonald’s at gate D8. Charging stations are at D21, D30, and D40. 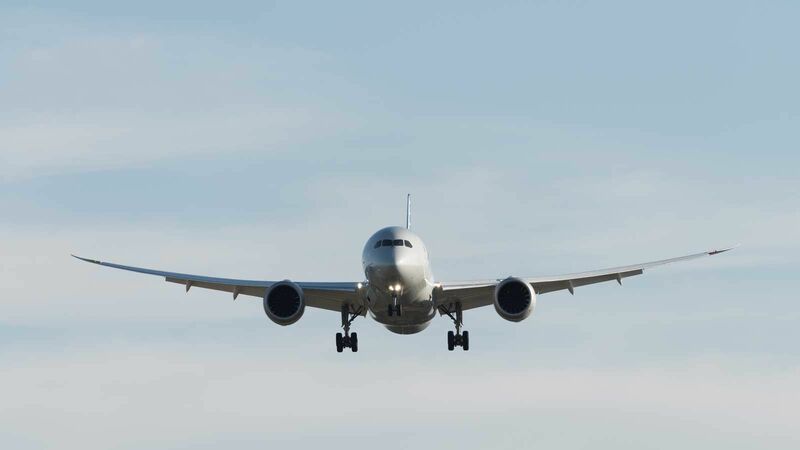 With 28 gates, Terminal E services Air Canada, Alaska Airlines, American Airlines, Delta Air Lines, Frontier Airlines, jetBlue, Spirit Airlines, and United Airlines. Security checkpoints are at E8, E16, E18, and E33, and TSA PreCheck is at E16. This terminal also offers CLEAR, the fastest way to get through security. Lounges here include the Delta Sky Club and The United Club. Terminal E grub includes many different eateries not available in other terminals of the airport. There’s a Blimpie sub spot, Blue Mesa Taco & Tequila Bar, IHOP, Genghis Grill, and a Wendy’s. Drew Pearson’s Sports 88 is a sports bar dedicated to the NFL legend himself. For a taste of Fort Worth, Love Shack serves up tasty burgers by Texas chef Tim Love. Uno Due Go offers Chicago-style deep-dish pizzas and sandwiches, and Sonny Bryan’s Smokehouse satisfies barbecue cravings before boarding. Shopping in this terminal is a bit more limited than in others, but there is a Marshall Rousso for women’s fashion, LICK Candy Store for candy found around the world, Hudson News, Southwest News, and the NBC-5 Travel Store. Tech goods are at Best Buy Express, Sound Balance, and InMotion Entertainment, and last-minute souvenirs are available at Texas Marketplace and Lone Star Attitude. There is also a currency exchange. The second Gameway location is in this terminal, along with The Bubble by Coca-Cola and another yoga studio. Pampering is available at XpresSpa. The charging station for this terminal is at E37.